Schedules serve the purpose of determining when your phone number(s) will receive calls from Tiksoo and when it won’t. If your business operates from Monday to Friday opening at 8:30am and closing at 5:00pm, then you may wish to only monitor your numbers during this time. Creating a schedule that matches with the days and times your business is open is a great start in making sure your customers can reach you during these times. Let’s say you have offices in Toronto Chicago and Los Angeles, all operating from 9am to 5pm in their own local time zones. You can easily create individual schedules for each location, and by taking advantage of the “Time Zone” feature, you will not need to figure out how many hours any one particular office is ahead or behind. In my example below you can see that I have created a Monday to Friday schedule operating within the hours or 9am until 5pm and it is set up for Pacific Time. Looking at the figure below you will see that you can simply check or un-check the box below each day. When the box is checked the name of the day is displayed in GREEN making it easy to identify what particular days are active within this Schedule. Similarly the inactive days are displayed in RED. 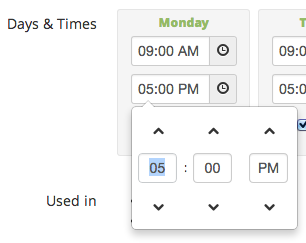 Changing the times is as easy as clicking the clock icon on the day that you would like to change and then simply either use the up and down arrows located above and below the hour, minute and AM/PM boxes. To make a copy you simply click on Actions ? Copy and then make the desired change and save it. In a situation like this your company may be held legally liable for any mishaps should a customer not have access to the emergency number so you would want to be sure to monitor this number from the time the office closed until the time it re-opens to ensure that the proper information is always available. Once your Schedules have been created, you can view them all from the main “Schedules” page. In addition to having descriptive names that allow for quick identification, you will notice that each Schedule has the active days displayed in Green and the inactive days displayed in Red. 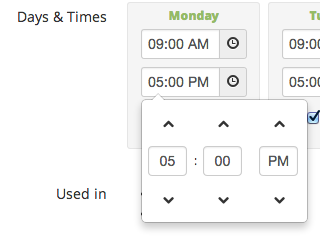 For a more detailed view of the start and stop times of each day you can hover your mouse over the day you would like to view. Other details such as the Time Zone and whether the schedule is inverted or not is included here as well.